No one offers more specialty grades, species or selection. 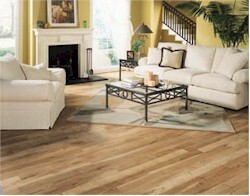 Mullican Flooring is the world leader in high quality specialty hardwood flooring. Mullican offers a complete line that includes Clear, Clear Quartered and Select Quartered oaks, herringbone slats and specialty species like Ash, Cherry, Walnut, Hickory and Hard Maple. Plank is available in 3", 4", 5", 6" and 7" widths in a wide variety of species and sizes. Rustic grades are also available. Mullican goes to great lengths to create flooring with unmatched quality and precision, giving you the ultimate in satisfaction. Mullican's exclusive process of making the finest hardwood flooring starts in the Appalachian Mountains of the eastern United States with prime, slow-growing hardwoods. After special stacking and slow drying, each piece is straight-line ripped to remove any side bend. The most efficient kiln-drying process in the industry is used to maximize the stability of the wood during the hot and cold seasons. State of the art machinery reduces both labor costs and time while enhancing the overall product and ensuring that the customer receives the best quality flooring available. Quality control specialists make sure the moisture content and milling are always consistent. Unlike other companies who only spot check, Mullican's experienced manufacturing team inspects every inch of the flooring during each step, ensuring the milling quality and grade of Mullican flooring are consistently of the highest quality.